Pestiños are a simple and great recipe that you should add to your repertoire. Also, if you’re good at making them, you can always prepare them for the rest of the year. All hands on deck in the kitchen! In a mortar, grind the sesame seeds together with the cloves. In a bowl, combine the flour and the salt, and add the sesame seeds and cloves. Fry the orange skin with half a glass of oil. When it is golden, remove the skin and let it cool. Temper the wine and mix it with the flour. Strain the oil (temperate) in which we fried the orange peel and add it to the flour. Knead. If needed, add more flour, so the dough doesn’t stick to your hands. With the dough, make balls the size of a walnut and then roll them out with a rolling pin. Take the two opposite ends and stick them together in order to create a lace. Once you have made all of the pestiños, fry them in plenty of hot oil for a few seconds. It is advisable to remove them on absorbent paper. Mix the honey evenly with hot water. The pestiños are covered with honey once they cool down. If you want to surprise guests with this recipe of pestiños, you can always make half with honey and the other half with sugar. Mix 100 grams of sugar with two teaspoons of cinnamon powder. You can also add sesame seeds. 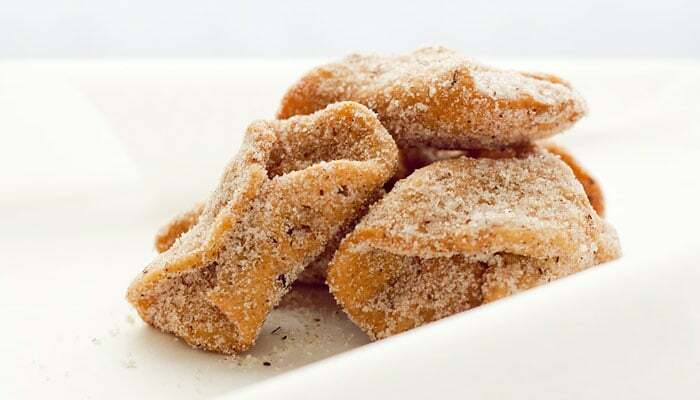 While the pestiños (when fried) are hot, they can be covered in the mixture or spread over the candies.